"Sir, my concern is not whether God is on our side; my greatest concern is to be on God's side, for God is always right." 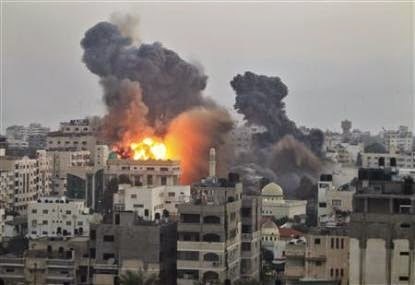 Every so often, violence explodes in the Middle East, particularly around Israel. The very existence of the nation seems a magnet for anger and violence, and while every single president of the US since Nixon has tried to find a solution, they've all failed miserably. The most recent spate of violence has dragged up all the same tired old arguments, with people picking sides and accusing the other of lying and staging news events. Ancient animosities against certain ethnic groups are growing again, and people are dying. It wouldn't be that hard to go through the actual events and weed out the core of what's going on and why, nor to find where the problems lie, but there's another aspect to this I want to consider. How should Christians respond to these events? Some instantly and without thought leap to the side of Israel. For many in America, this is an easy call because of their theology: Israel is God's chosen people and the final battleground when Christ returns. For others it is a matter of being sympathetic toward Jews as a sort of kinship: we share a Testament and thousands of years of religious history. And for still others, the memories of the horrors in WW2 make them tend to side with Jews against anyone. As Christians, our first and central concern in anything should be what glorifies God. We cannot let anything, no matter how compelling or emotionally powerful, eclipse that central truth. This is often to work out in the modern world, but at the very least it means that we should respond in love, humility, and truth. Simply put, that means when presented with some event or story, we should first be humble toward whoever brings this to us, not dismissive and arrogant. We should be loving, so that we are first concerned about the people involved and the cost in lives and family, whatever group they happen to belong to. And we should be concerned with the truth both in our statements and in what we learn. All war brings with it lies, distortions, rumors, misinformation, and propaganda. Its easy to find examples of how these lies and propaganda are spread, and the more media-savvy and less scrupulous a side, the more willing they are to use it. Christians should be more interested in finding the truth and ignoring lies than having their personal preferences confirmed or politics supported. If Israel lies about the purpose of a tunnel, then we as Christians should recognize that and consider it. If palestinians lie about where they are launching rockets from, then Christians should recognize that and consider it. The key here as in all things is to be not motivated by what we wish to be or are inclined to believe to be true, but what is actually true. And further to not choose sides out of some sense of team playing or what is gained politically, but to be on God's side, always. Sometimes that will mean sympathy for one side of a conflict, sometimes it will mean the other. And always our prayer should be for peace and an end to war and hostility. Christians should always favor peace whenever possible and it is within our power. As the Bible says, there is a time for war, but we should be known as peacemakers and lovers of peace first and foremost - reluctant to fight, not eager. Our prayers should be for the families on both sides, for the survivors of those killed in the conflict, for the leadership of both sides to seek peace and do right rather than what best serves them. We should do what we can to aid people in need, and show Christ's love wherever there is suffering and want. And we should always be first to recognize that all humanity, whatever group they are in, however they behave, are made in the image of God, so that their lives are sacred, and their souls may yet be saved to eternal glory. Sometimes it seems like the whole world is burning, and that we live in the worst possible times. Many times in the past people have felt this way - imagine what went through the heads of people in WW2, during the Napoleonic wars, during invasions by Genghis Khan, the black plague, and the fall of the Roman Empire. All of these were times of horrendous catastrophe and calamity. Is the world coming to an end? Some day, in God's time, and for His glory. Until then we have a duty to do what is right and obey Him to his glory where we are and when we are. Christ's return should catch us doing His will and showing love, not squabbling and cheering for death. *You may note I never capitalize "palestinians" even though spellcheck angrily scribbles red under it. That's because the title presumes an ethnic, national identity, which they do not share. There isn't and never was a nation of "palestine" only a region. There is no ethnic group of "palestinians" because they were nomadic over a very large area, and many are simply there because they were dumped there from countries such as Syria to get rid of them. My lack of capitalization is a protest against trying to craft a fictional, mythical history for these people, not out of disrespect for them individually. This is part of the Christian Response series.